If you have ever wondered how to spy on text messages while looking at your children or employees who are constantly typing something on their phones, but you didn’t know what to do, now you have a solution. With the help of this app, you can stop worrying about your children and their online presence because you know that you can guide them in the right direction, but it can only be achieved when you’re aware of what they do. What are the functions of this app? 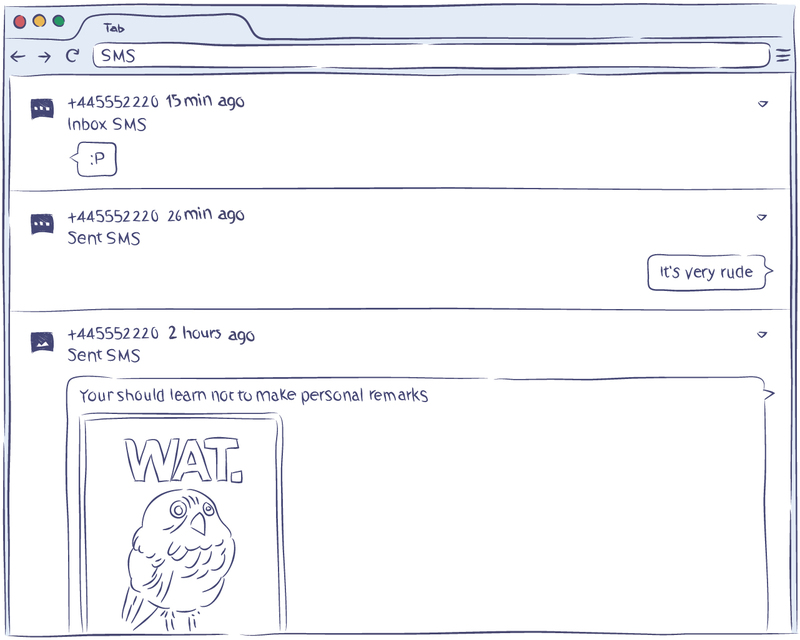 Spy on text messages regardless of whether they were sent or received by the user. Read the messages received and sent using WhatsApp, Facebook and Viber. View calls information, including time, date, duration of the call, and contact name. Get access to phone book information, including contact names, phone numbers, and any additional information, such as occupation or email address. View entire browser activity and see when and how often the device user visited certain websites. Get a picture every time a user unlocks the phone to see who is actually using it at any given moment. Track location of the Android device user. Receive a notification every time a user changes the SIM card to a different one. Remain in the invisible mode so that the user is completely unaware of the presence of this free text message spy even if the device is unrooted. As you can see, this software gives you a chance to do so much more than just spy on text messages. Free Hoverwatch account allows you to track up to five devices, so if you have more than one kid or need to use it to track the activity of your employees, then this spy software is perfect for you. The combination of all these functions is definitely sufficient when you want to know as many details as possible because they cover every aspect of the users’ activity. While text messages are still incredibly popular among users, people who are used to sending dozens of messages a day prefer more convenient ways of communicating, including WhatsApp and Facebook chats. Such tendency is especially noticeable among younger people who spend hours browsing through social networking sites, so being able to view these messages is extremely valuable. Fortunately, with the help of this text message spy, you can see which messages were received and sent using the mentioned apps. Besides text information, you can view the pictures, videos, and audio files that may be attached to the message. Such opportunity is especially great if you’re using this tracking software to protect your kids becausethe online world is not the safest place for young children. The parenting of children in the 21st century requires more innovative approaches and using the Hoverwatch app to spy on text messages of your kids is definitely the best way to make sure they don’t get in trouble or ignore their education altogether. Thanks to the fact that all the information is sent to your online account, you’re able to access it from any device that has the Internet connection, which is especially convenient when you’re always running errands or travel. Unless the users know exactly where to look, you have nothing to worry about because it’s impossible to notice that the app has been installed on their devices. During this spy app installation, you can choose to enable or disable specific functions depending on what your goal is. How can this spy app become useful to you? We live in the world where online activity has become such a huge part of how we communicate with one another that it is quite difficult to remember how we interacted before the occurrence of all the social networking website and apps. While there are a lot of benefits that come with an easy access to the Internet, it can be quite difficult to ensure proper protection of your children in this digital age. In such a way, using this free text message spy is not something that should be viewed as the last resort, but rather as a preventive tool. Constant texting and playing on the phone can affect the education of your kids as they are constantly distracted and can’t properly focus on their studies. Once you install the Hoverwatch software, it’s possible for you to view which websites are opened by your child and whether they stumble upon any images or information that is inappropriate for their age. Also, children can be quite secretive when it comes to their problems with friends or incidents of online bullying, but the app gives you an opportunity to know when something goes wrong. Moreover, some children are naïve and can engage in communications with strangers, which can be extremely dangerous. When we talk about your staff members, the issue is that the majority of working hours can easily be wasted playing games on the phone or chatting with friends online. Obviously, you can’t stand over your employees and control every move that they make, which makes it difficult for you to know when they ignore their job responsibilities. It may seem insignificant to some people, but it has a very negative impact on the level of productivity at work, and you will definitely notice the improvements once such distraction is eliminated. A lot of employees spend at least several hours secretly reading their favorite websites or watching videos online, and even when they’re done, the level of concentration is still not at the level it should be. When you know how to spy on text messages and monitor the activity of your employees, it’s no longer a problem that can affect your company’s success.